With Chef Tioga (Matt) Toomey at the Whoa Nellie DeliOne of my favorite non-wilderness destinations in the Sierra is the Whoa Nellie Deli at the Mobil Station in Lee Vining. 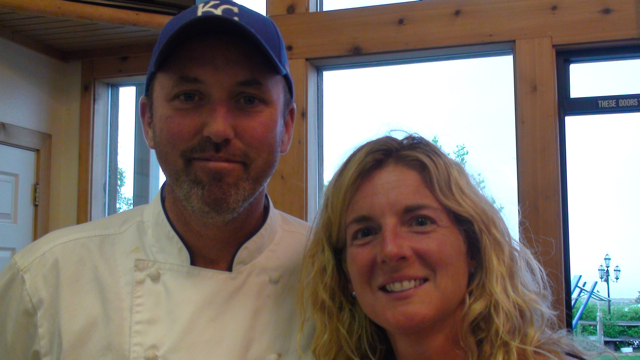 Aside from the allure of the scrumptious fish tacos and mango margaritas, I love talking baseball with Chef Tioga Toomey as even with his (misguided) affinity for the Kansas City Royals, he still appreciates my hometown Red Sox. After gorging myself on the great food, I usually stop and take a photo of one of my favorite views of Yosemite right outside the Mobil Station entrance. If my topo map reading skills are correct (not always a safe bet) the view features the side of the Dana Plateau (my favorite place on earth) and Mt Gibbs. Being sort of a weather geek, I like to snap this view at the same time every year to compare the snowpack. I missed it only in 2008 and 2009 when I was working in Yellowstone. View from the Mobil Station on June 23, 2007 (Photo by Beth Pratt)The Sierra Nevada has experienced a phenomenal snow year—certainly one of the strangest I have experienced in my twenty years in the state—with the snowpack registering at over 200% of normal (and higher depending on the location). Yet as noted in a recent article by Peter Fimrite in the San Francisco Chronicle, the unusual pattern isn’t due to the amount of snow that fell (which was still a bunch), but the timing of the snowfall. View from the Mobil Station on June 24, 2011 (Photo by Beth Pratt)As every Californian knows, once summer arrives, it begins to get hot. Very hot. Temperatures rise quickly and a snowpack that is still preserved in June is apt to become liquid very fast. And for the same reason that Yosemite’s visitors are delighting in the late season waterfalls this year, residents downstream in the foothills and the Central Valley have been on flood alert. The Central Valley historically served as a major floodplain that absorbed water from snowmelt, but the region today is one of the largest hydrologically altered areas on the planet and human development has largely replaced natural river flow. Yet even with this above average snowfall and late season precipitation, the snowpack in the Sierra Nevada and the West is declining—on average the snowpack in the western states has declined 30% in the past fifty years. Why is this significant? Because 70% of our water in the west comes from snow. The repercussions of climate change on our water supply are frightening even if the best-case scenarios prove to be the worst. The inevitable response to this unusual snow year for the Sierra Nevada has been to debunk climate change. The accurate counter to this false claim is that anomalies in a single year do not disprove the overall trend, which in this case is a long-term decline. A recent blog post by Alyson Kenward on Climate Centralexplores this issue and also offers the interesting graphic illustration below of snowpack levels as of June 1 from 2004 to 2011. So I’ll continue to snap photos of my favorite view in Yosemite after my fish taco feasts and baseball chats at the Whoa Nellie Deli. And I’ll enjoy the abundance of snow decorating the granite cliffs this year (and lament how late hiking season will come in Tuolumne), but my hunch is I’ll see less and less white on my favorite peaks in the Sierra for years to come.